Something transformative happens when dance is taken out of the theater, out of the studio, and in to the open air. 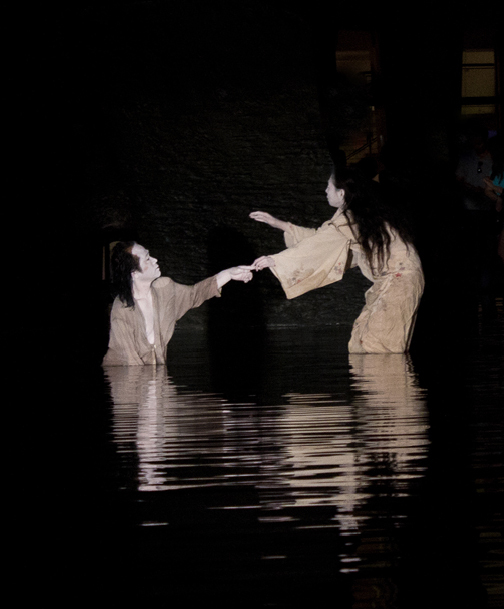 Eiko and Koma’s performance of Water carried things one step further. 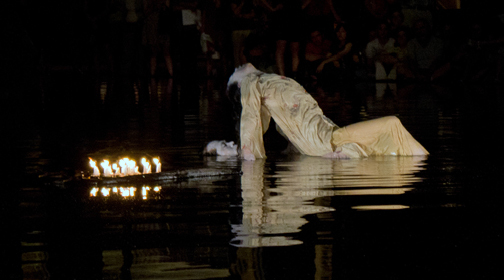 It was performed in the pool in front of the Vivian Beaumont Theater, after dark. 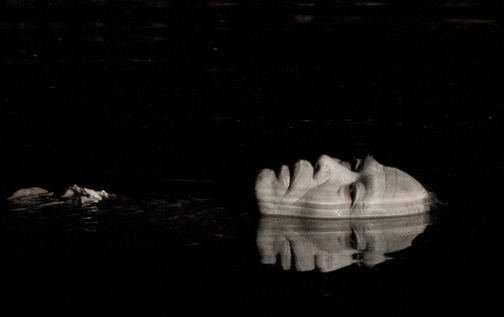 In the midst of the noise and tension of as artificial an environment as New York City, the atmosphere of the production took me back to what is natural and eternal – an element like water. Even when outside noises and images intruded on the evening, like the sound of a motorcycle roaring up 65th Street, or the sight of red lights and flashes on the cameras of those in the audience, the undercurrent and the integrity of the performance couldn’t be violated. Eiko appears. Her entrance is so quiet and unobtrusive that I only notice she’s there when those around me start pointing at her. She is being lit with white light, and she looks other-worldly. Standing alone in the water, dressed in a white kimono, she could be a spirit or an intercessor between this world and the unseen world. Her face is white, her hair is loose and her arms are lifted to the sky. The water in which she stands is dark and still. Her reflection and the ripples in the water which radiate from her body, create the most beautiful images. She seems to be part of the water. Her movement is so very slow and lovely, giving the viewer the opportunity to experience every tiny detail of every gesture. Her facial expression is sometimes pained from struggle, sometimes resigned to her fate, and sometimes impassive, calm and knowing. Koma approaches her from behind and lifts her hand. There is no clear narrative here – I think it’s left up to the viewer to decide what he or she is seeing. To me, it seemed that Koma was in peril and Eiko had the power to help him, even if it meant interceding on his behalf with what cannot be seen. Slowly, he lowers himself into the water. As he does this, I am taken by the beauty of their bodies against their reflections on the surface of the dark water, and the way that their physical presences grow gradually smaller as they slowly submerge. The slightest rise or fall from the water seems to change the physical size of them. Koma continues to submerge until only his face and one shoulder can still be seen. There are passages in which only the dancers’ faces and hands break the surface of the water, and though they become very small physical presences, we still feel the presence of the entire body and its spirit, its emotion, its motivation and its movement. Musician Robert Mirabal (above), who provided the haunting accompaniment on drums, shakers and Native American flute, is also partially submerged in a corner of the pool. He’s not lit and he is sitting alongside a raft made of pieces of driftwood. 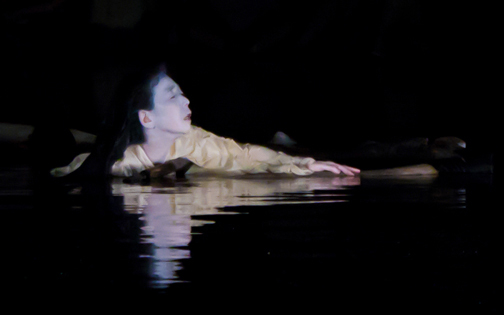 His movement is as expressive and reverential as the dancers’ as he sets the raft drifting toward Koma. The raft approaches at this same extremely slow pace, soon to be accompanied by the sound of the drum, a steady rhythm that sounds like a rapid heartbeat, and then joined by the sound of a shaker. Tension builds, then gradually eases as the drumbeat slows, giving way to the pure and powerful call of the wood flute. 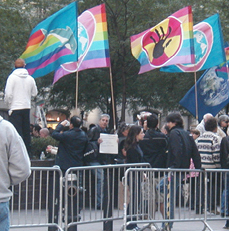 Eiko and Koma are natives of Japan. 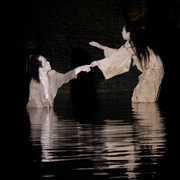 They are dressed in kimonos and they are wearing Butoh makeup on their faces. So one can’t help but be reminded of the recent devastating events in Japan and the part played by water, or by man’s manipulation of the natural world. Though the waters are still in Water, we can sense that the characters share a story which may not be completely resolved, and perhaps the water will become a permanent part of them, if it doesn’t overwhelm them all together. The performance and the notes from the program leave the audience with much to consider. Water is essential to our lives. Our bodies are made of water, water cleanses us, water fosters the growth of crops, water quenches our thirst. Water moves around an obstacle to reach its destination. Water is eternal. But water can also overpower. Water has a spirit of its own and water demands respect. Toward the end of the piece, Koma receives a small raft full of lighted candles, and this act also conjures an atmosphere of the eternal. The raft of candles and the two figures slowly drift into the darkness. Just as when it began, I never really knew when Water ended. But the mood that it created was so intense, that it seemed disorienting to find my feet and leave the plaza once it was over. The performance was so moving, so beautiful and so special because of where it took place. To view an exhibit of sets, costumes and videos chronicling the 40 year old collaboration between Eiko and Koma, visit Residue, an Installation by Eiko & Koma, at The New York Public Library for the Performing Arts. 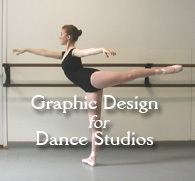 Now through October 30, 2011. 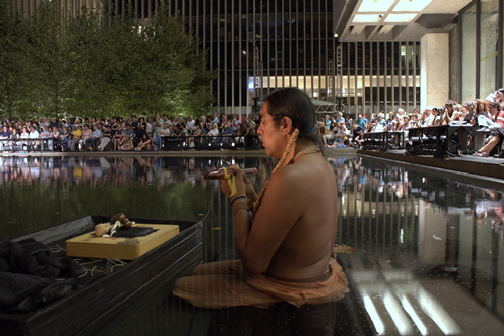 This entry was posted in Dance, Karen and tagged Eiko & Koma: Water, Lincoln Center Out of Doors Festival, Robert Mirabal. Bookmark the permalink.